Victor, I'm not sure about what kind it is... have a look at the photo I just posted. I think it came in about a 4 foot width and the length was whatever you needed. I got it from Fabric Land in Calgary, Canada. What about using the Pepper's Ghost effect with this DVD? In essence, playing the DVD on a computer or TV, laying the monitor on its back and setting a piece of plexiglass over it and an angle. This is used to project an image that looks like a hologram, but would the same work with this DVD? @Brighid -- A neighbor in San Diego used the plexiglass trick. It works -really- well! That rear projection material is $60/yard !?!? Good lord. I'll stick with $3.99/yard stuff. This year, I used Wax Paper for rear projection in my front window and it worked *amazingly* well. I just tore off window-height strips of generic store-brand wax paper and taped it to the inside of the window. What amazed me most was that even though it didn't look sharp on the inside of the house, it looked amazing on the outside (got a lot of feedback- everyone was wondering how I was able to get such a high quality image into my window). The wrinkles, misc rips, and overlap in the waxpaper also added some nice texture to the footage as well (I was sloppy putting it up). At $2 a roll, the price per square foot can't be beat (try it, you'll like it)! 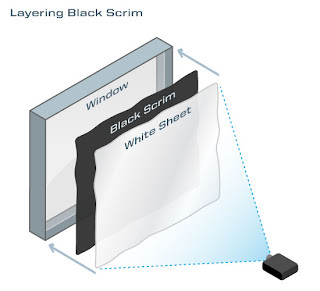 I am interested in scrim projection-may I ask what the white sheet in your graphic does? 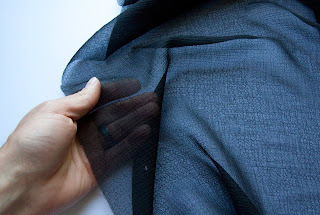 I haven't seen that anywhere else when researching projecting onto scrim. Thanks! Ahhh, thanks for the information, this was exactly what I needed. I see folks using white scrims, it's just to visible.